This lighter take on a traditional Au Gratin Recipe combines the delicious flavors of feta and spinach, layered between soft and buttery Yukon gold potatoes. It makes a wonderful idea for a Weight Watchers breakfast casserole, or serve it as a side dish with dinner. I strongly recommend using a mandoline slicer to slice your potatoes to the right thickness. It helps you get a nice, even doneness to the dish, and the uniformly sliced potatoes all look so pretty! It’s difficult to hand slice potatoes so thinly, and the thinner the potatoes, the bigger the serving size appears. Also, using the mandoline cuts down prep time dramatically. I used Yukon potatoes with this au gratin, but you can use any kind you like. I also left the skins on, because I like getting the added nutrients from the skin. 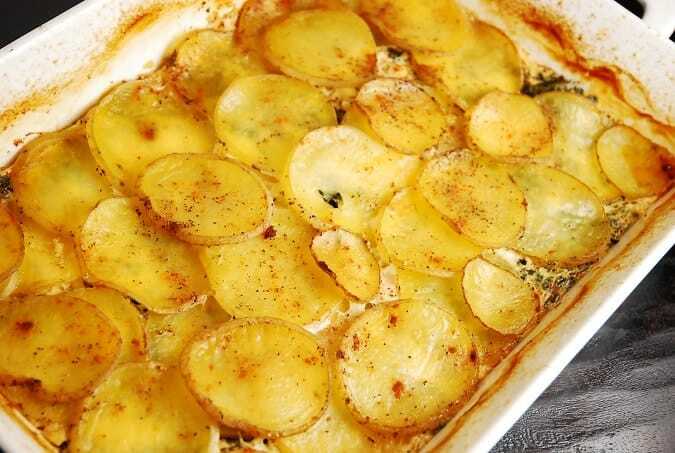 Once you get those potatoes sliced, this Spinach, Feta and Potato Au Gratin is such an easy dish to prepare, and can be enjoyed by the whole family — no one will have any idea it’s a Weight Watchers Recipe! This Weight Watchers Au Gratin recipe makes a wonderful idea for a breakfast casserole, or as a dinner side dish. It’s versatile, incredibly delicious and just 5 Points per serving. Soft, buttery potatoes sandwiched with spinach and feta, and baked in a milk and egg sauce gives this tasty casserole a lot of bang for its buck. Preheat oven to 375. Spray a 9x13 baking/casserole dish with non-fat cooking spray. Squeeze out as much water from the spinach as possible. Layer half the potato slices in the baking dish (it’s ok to overlap them a bit). Season with salt, pepper, and paprika. Top with the spinach and feta cheese. Then cover with the remaining slices of potatoes. Season these potato slices with salt, pepper, and paprika. In a medium sized mixing bowl, whisk together egg substitute, milk, garlic powder, onion powder, salt, pepper and the 1 tsp paprika. Pour mixture over the potatoes. Dollop butter evenly over the top (I just placed little pieces of the butter all over the top, and then spread it a bit with a spoon). Cover with foil and bake for 30 minutes, or until potatoes are tender. Remove foil and bake for another 30-40 minutes, or until top of au gratin is golden. Remove from oven and let cool about 10-15 minutes before serving. Cut into 6 equally sized portions. A mandoline slicer is highly recommended for slicing the potatoes. Has anyone tried this reheated? I was thinking of bring it to a potluck and wanted to make it the night before. I would also like to know what size baking dish to use. This looks good! I love anything with feta and spinach! What size baking dish did you use – 9X13 or 9X9 square? That was a 9 X 13 dish that I used. Sorry I forgot to include that in the instructions! I’ll update it now….